Large numbers of devotees throng to this temple during the special auspicisous festival like Ganesh Chaturthi and Samakranthi. Sacred Darshana of the deity is a blessing for the visitors. Other famous attractions in the temple are Rathothsava and Deepothsava or 'Festival of Lights', celebrated with much enthusiasm and piety. It is one among the ancient temples of Dakshina Kannada District. The story of its origin and importance of the temple is narrated in the Skanda Purana. This temple was built in the 12th century by Tuluva King Veerabahu. The Shrine of Lord Sharabeshwara is located on the western side of the temple and that of Mahaganapathy is on the south. Yakshagana Thalamaddale takes place every Sunday evening. Poojas and Gana Homas are also performed as sevas. More than 800 years ago King Veerabahu ruled the famous Tulu Kingdom. One day, Veerabahu went on a hunting expedition during which he killed wild animals that devastated the farmers’ crops. He came to a vast forest area with a famous Shiva temple - Swarna Kadali Kshetra. He worshiped Lord Manjunath there with intense devotion. He saw a thick forest to the west. In the middle of the forest, the Tulu king saw a tiger and a cow standing close to each other and thought that the tiger was about to attack the cow. The king shot an arrow at the tiger but unfortunately it killed the cow instead. Upset at this incident of gohatya, the king ran to sage Bharadwaja for a remedy for this sin. Sage Bharadwaja then later gave the king instructions about constructing the temple. First, before constructing the temple, the Tulu king had to build a tank to the north. To the temple’s south, a stone idol of the cow had to be built. The sage assured the king that by the power of his meditation, he would see to it that the water of River Nethravathi, flowing near the Gorakshram, emerged from the gomukha as theertha. The Shivalinga that would be installed at the spot would be known as Sharabeshwara and the tank would be called Sharabeshwara Thatak. Then the king had to construct the sanctum-sanctorum, mukhamantap, paulis and the gopura. Sage Bharadwaja himself would install the Shivalinga. The king, in order to please Lord Shiva, had to feed one lakh Brahmins. The sage told the king that the deity Sharabeshwara would now be called as Kashi Vishwanath Himself. Sharatheertha which is called Ganga theertha (holy water of Ganga), and Sharapura would become famous as Kashi Kshetra (abode of Kashi Vishwanath). Later, one day, Lord Ganapathi would visit the place and would manifest Himself on the southern wall of the temple. 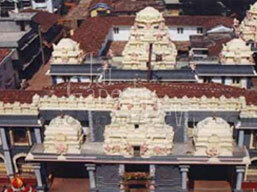 In view of his proximity to Lord Sharabeshwara, the temple would be known as Shri Sharavu Maha Ganapathy Temple. Veerabahu then with all his strength started constructing the temple as per the sage’s instructions. Veerabahu decided to stay at Sharapura for sometime with his wife. During this period, the chieftain of Gangawadi (now known as Bangadi) Chandrashekhar Jain was harbouring hatred towards VishnuVardhan, the Hoysala king, as he had deserted the Jain faith and converted himself into a devotee of Lord Vishnu. Chandrashekhar Jain was killed in his battle with VishnuVardhan. His son, Veera Narasimha Bangaraja then approached King Veerabahu for refuge. At the instance of the sage, Veerabahu adopted him, making him his legal heir. Veera Narasimha Bangaraja built a palace to the east of the Shiva temple and lived there. One day, Goddess Mangala Devi appeared in a dream to Bangaraja and told him to look for a stone idol to the west of Goraknath Ashram. She instructed him to construct a temple at that spot and name it Mangala Devi. She also ordered him to name the area between Sharavu and Mangala Devi as Mangalapur. Annual festival in April which is celebrated during Ganesh Chathurthi in September and Laksha Deepothsava in November is the best time visit.